SeoulTech opened an advanced robotics offline course for students at the START Hall in the Central Library on February 15th. Many students were interested as the course offered hands-on experience with robots and drones. 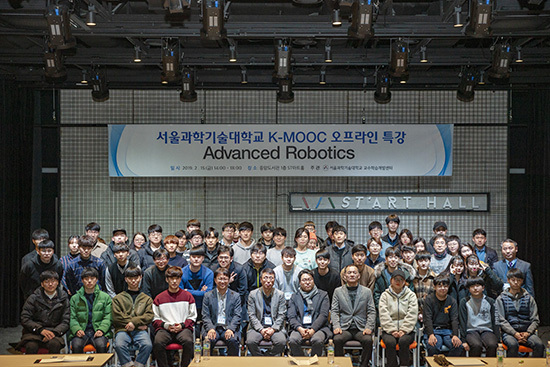 The Advanced Robotics course was part of the K-MOOC Robotics course that SeoulTech created in 2017. The course offers basic education in robotic engineering and aims to provide practical experience in the development of the industrial field and understanding the different robotic branches. 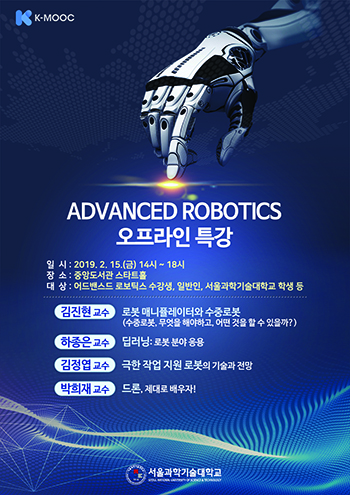 The program was hosted by Center for Teaching and Learning, and included content on robot manipulators and underwater robots by Prof. Kim Jin Hyun, deep learning applications in robotics by Prof. Ha Jong Eun, the outlook and technology of robotics in extensive labor by Prof. Kim Jung Yeob, and proper education on drones by Prof. Park Hee Jae. SeoulTech has offered two courses on robotics and the management of electric vehicles since 2017 and will open a joint course, selected by the Ministry of Education last year, called Advanced Robotics starting in March 2019. SeoulTech’s Advanced Robotics course currently includes openings for Prof. Kim Jin Hyun’s robot manipulators and underwater robots course, and courses on mobile robots, humanoid robots, and basic education and programming of drones will be offered starting in March.